The Ricoh Fax 1190L facsimile is an intelligent multifunction device that helps small to medium-sized offices save space and money. It includes faxing as a standard along with reliable copying and printing functions, but the Ricoh FAX1190L laser fax machine can be overwhelming to operate, lacks a scan function, and it does not offer much in the way of print and copy features. The compact footprint of the Ricoh Fax 1190L allows for easy integration into most office environments including those with limited space on their desktop. The multifunctional Ricoh 1190L fax printer runs on 16MB of memory and has a 250-sheet cassette with a single sheet manual feed slot for specialty paper. The output tray can handle up to 100 sheets. 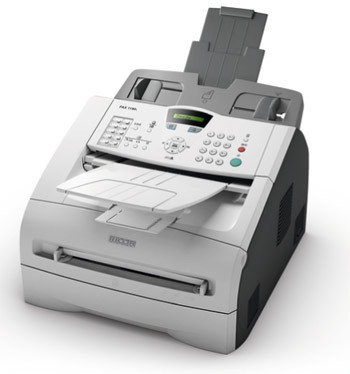 The Fax 1190L weighs approximately 7.35Kg without the drum unit and toner cartridge, while connectivity is mainly via USB. The device includes a busy control panel with a 16-character and single line LCD screen. The copier and printer have reasonable speeds of up to 15ppm and the 600dpi resolution ensures crisp and sharp text output. The Ricoh FAX1190L printer boasts a range of transmission and reception features including auto reception, fax forwarding, out-of-paper reception, polling, remote faxing, and volume adjustment. The machine has a 20-page ADF and a 33.6Kbps fax modem. The default memory of the Ricoh 1190L fax machine can store up to 500 pages. The Ricoh FAX1190L toner and drum are separated so that the drum does not have to be changed as frequently. There are limited options to upgrade the memory and paper capacity of the Ricoh Fax 1190L all-in-one printer, making it quite inefficient for a growing office. There are limited copy and print features. Only Windows operating systems can run the PC fax and printer functions. Two-sided printing is manual for the FAX1190L. The device cannot be shared by a network.